NY Labor Law: What Is an "Elevation Related Injury"? The Second Circuit Court of Appeals needed to know what, exactly, an “elevation related injury” was and sent the question to New York’s high court for interpretation. 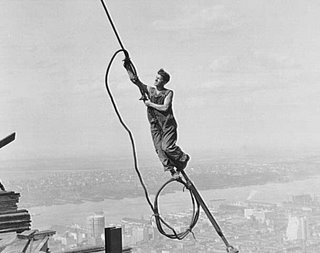 The issue in Runner v. New York Stock Exchange arose when workers were asked to lower an 800 pound reel of wire down four stairs. This was attempted by attaching a rope to the giant spool and wrapping it around a metal bar set against a door jam. The rope was then held by the plaintiff and another to act as a counterweight as the giant reel was lowered. Want to guess what happened? The plaintiff was drawn into the bar by the huge weight and injured. Enter here, New York’s Labor Law section 240(1) (also known as the Scaffold Law) which holds contractors and owners 100% liable to workers from gravity related injuries when proper safety devices are not made available to them. These suits usually arise from people falling from heights or an object falling from a height and hitting the worker. But in this case, the worker didn’t fall, and nothing fell on him. Rather, the item he was trying to lower fell at an uncontrolled rate. The federal jury dumped the plaintiff, after being instructed that that “liability pursuant to Labor Law 240 (1) could not be assigned unless plaintiff’s injuries had been attributable to a gravity-related risk.” They found that this was not a gravity related risk. I. Where a worker who is serving as a counterweight on a makeshift pulley is dragged into the pulley mechanism after a heavy object on the other side of a pulley rapidly descends a small set of stairs, causing an injury to plaintiff’s hand, is the injury (a) an elevation related injury, and (b) directly caused by the effects of gravity, such that section 240 (1) of New York’s Labor Law applies? II. If an injury stems from neither a falling worker nor a falling object that strikes a plaintiff, does liability exist under section 240 (1) of New York’s Labor Law? The relevant inquiry — one which may be answered in the affirmative even in situations where the object does not fall on the worker — is rather whether the harm flows directly from the application of the force of gravity to the object. This also rendered the second question — of whether the injury must come from either a falling worker or falling object — moot. But as a result of the laws, New York has a rather safe construction trade relative to other states. Because so much of the onus is placed on the contractors and owners, the Labor Law is under constant assault from big business. Safety, however, must come first in construction. Particularly since so many of the workers are immigrants or others similarly situated that aren’t in position to demand safety equipment, or to produce the witnesses after an accident. Co-workers, oddly enough, tend to see things in the light most favorable to their job security when their own jobs may be on the line. Thus, the need for the strict Labor Laws, and the need for the courts to interpret them fairly. In recent years, decisions from our top court seem to have been more defense oriented, as you can see from this article from the Wilson Elser firm, which does defense work. In this case, however, the NY Court of Appeals seems to have reversed that trend of limiting the scope of the Labor Law protections. And that is good news for those that care about worker protections.